Despite its long-haired, diva-like look, the Skye Terrier is a tough breed by nature. It approaches most obstacles with a fearless attitude and loves to be involved in an adventure or exploration. Because this dog is not incredibly active, unlike most terriers, it can be well-suited to live in a city. It is a very loyal dog but can be stubborn if it is in the mood. If the dog is familiar with you, it can be a sweet, loving companion. If this breed is approached by a stranger, it may be reserved and act awkward and cautious until it feels that the stranger is no longer a threat. If there are other dogs in your household, it will get along with them but when presented with a strange dog, it may be a bit territorial. Skye Terriers make wonderful watchdogs due to its protective and tough nature to protect and hunt. The hair surrounding the Skye Terrier’s eyes may require extra cleaning because it is much longer than most dog breeds. Its coat should be combed at least 3 to 4 times per week, but if it could be combed on a daily basis, that would be ideal. Being bathed regularly is also recommended for this breed because of its long coat. Its coat tends to collect dirt and germs, and can become itchy if it is left too long without a good scrubbing. Skye Terriers prefer to be house dogs and would not enjoy living full-time in the outdoors. They do require exercise, even if kept indoors, but the intensity level can be low. Moderate walks or shorts games are enough to keep this breed fit. The Skye Terrier does not suffer any major health concerns that many other terriers are subject too. The short-legged terriers, like the Skye, Sealyham, and Scottish, all somehow managed to escape the detrimental effects of major health concerns. However, the Skye is susceptible to some minor health concerns including the premature closing of the distal radius. Of course, in order to ensure that a Skye Terrier is in a healthy condition, it should have regular checkups and be monitored to ensure good health. This breed can live anywhere from 12 to 14 years of age. Scotland tends to be the starting point for most smaller, short-legged terriers, and the Skye Terrier falls right into this category. Initially, they were raised to hunt fox even otters because they are very successful hunters on land, as well as in water. The Isle of the Skye is where the breed was found in the purest form, and that is how it got its name. Its coat had been a famous trademark of this breed since as far back as the 1700s. Many different types of terriers were grouped in the Skye Terriers category initially, but in 1840 Queen Victoria fell for the breed increasing the dogs popularity. 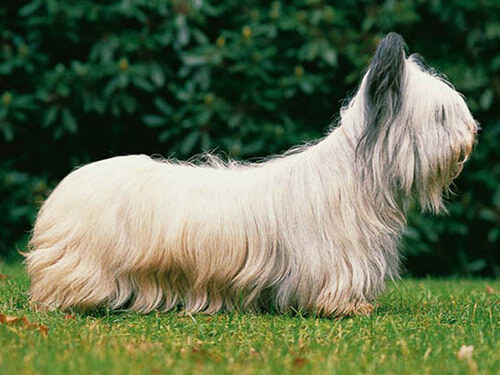 The Skye Terrier eventually made its way to the states where the AKC recognized the breed in 1887.